“But we must be careful to avoid making the basic error of setting up one translation as the standard over all others. Our standard must always be found in the question, ‘What did the original author of Scripture say at this point?’ We first must be concerned to know the words of Moses and David and Isaiah and Matthew and Paul; the words of the KJV translators may be important, but they cannot take precedence over the words that were the direct result of divine inspiration” (emphasis mine; p. 167-169). White is exactly right. When it comes to Bible translations, we are being illogical if we start with the presupposition that a certain translation is the only perfect one. Some KJV-Only advocates carry this argument out to its ugly and logical end when they say the KJV is even superior to the Hebrew and Greek manuscripts(!). And here’s another case where fundamentalism and liberalism end up holding hands: they say the Hebrew and Greek manuscripts are not trustworthy. Obviously this is not a historic Christian belief! 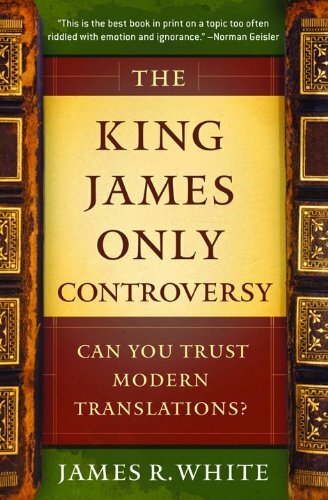 Later I’ll come back to White’s book, The King James Only Controversy. For now, let me say I highly recommend it for those of you who are KJV Only people and for those of you who aren’t. White is clear, kind, logical, biblical, and convincing in this outstanding resource.